Great post thank you all Bunty, Elaine, Maureen, Bootle Expat , Shelagh and ab. went to that school happy days remember Quarry road. Elaine, had to smile at mention of needlework teacher Mrs McBride..daughter Diane also terrified of her.. dreaded every sewing lesson...McBride called her hopeless!! So relieved when they moved over to main building! Enjoying all the memories of this old Bootle School!! Last edited by Ernie Jackson. (Bunty) on Mon Apr 25, 2016 11:18 pm, edited 1 time in total. On the subject of Beddie Road School it seems appropriate that (for those who haven't read it) I should copy this extract from a book I wrote several years ago. It might bring back a few more memories. I woke up in an empty house that morning. I knew my sister would have left early for her school and my dad would be at work but, strangely, my mum was out too? Good, I didn’t have to wash my face or comb my hair and I seized the opportunity to miss breakfast too, so I could get to school early and play, before the assembly bell sounded. My school, Bedford Road Juniors, to me the best school in town, was just a mile away but it seemed a long walk in those early school days. As I walked I reflected on mum’s absence but soon forgot about it when I saw my pals up ahead and ran to join them. teacher supervising the assembly that day, emitted a sound that demanded, and instantly achieved, obedience. This noise, instilled from early induction to school life, was the mandatory sound for bedlam to cease and organized lines to be formed. On her command we would file quickly into school, one class at a time, leaving an empty, desolate, playground. centre of the yard , pink tongue lolled out, head to one side, bemused and with one ear cocked crookedly. He was certainly prepared to wait patiently for the children he knew would exit noisily from the school later. The crocodile lines, in turn, made their way through the wide, red brick, arched entrance, into the warm smell of new floor polish and chalk. They continued along the corridor the only sounds coming from the out of step tiny shoes, like the clattering of a thousand golf balls descending from height onto the highly polished, though well worn, woodblock floor. Each class would disperse into the adjacent cloakrooms to hang outer garments on racks of numbered coat hooks at a height conveniently within reach of small, stretching, children. Coats safely hung, the groups moved on into the Assembly Room and stood in rows. Morning Prayer was taken and after singing of ‘All things Bright and Beautiful’ they were dismissed to their various classrooms. The Induction Class seemed so long ago. This was my first ‘real world’ and it was a different, big boy, school life. I was now a ‘junior’ and I had to work. The low, circular table and four tiny, wooden, surrounding chairs I knew as an infant had been replaced by a well worn, oblong, one piece, varnished oak-wood desk and bench. This accommodated two pupils, side by side, in uniform rows of 6, facing teacher and blackboard, at the head of the room. The desktops bore initials and graffiti carvings from the past, even back to when the school was first founded hundreds of years before. gradually sloping down towards my lap. Across the top was a flat ridge to accept pencils and ink pens with a small hole at either side to accommodate the white, porcelain ink wells, some chipped around the edges but nevertheless kept filled by the pupils appointed as ‘ink monitors’, a much valued position, though not as prestigious as ‘milk monitor’. Immediately below the ridge, flush with the surface, were two brass hinges which enabled the remainder of the desktop to be lifted to reveal a good sized compartment beneath. This contained personal exercise books, spare pens with nibs of varying thicknesses, maybe a bottle of red ink, the ever required eraser and many other items important to an eight year old student. It was a class of both sexes, too poor for school uniforms. Boys wore short trousers, mainly grey, open neck shirts and sleeveless woolen pullovers in all colors, plain and mixed, painstakingly and lovingly knitted by grandma’s and mums. They had grey knee length socks, handy for keeping one’s wooden ruler, and black lace up shoes sometimes with cut out cardboard inner to cover the hole in the sole, which was only good on fine days. Girls wore white ankle socks and plain, usually black, shoes, either laced or with ankle straps secured by a single button. Short cotton dresses of any color or design, badly creased from the waist down after having being tucked into navy blue bloomers at play time. This enabled them to ‘handstand’ without the dress falling inconveniently over their head. Boy’s had long since stopped gawping at this activity. Our teacher, Miss Fleetwood, although usually stern, was barely able to keep full control of her class of thirty six pupils. Later life was to prove that about half of the class would come to the attention of the police and ten percent would serve time in prison The remainder would grow up to be average, whatever that may be in this town where it was said the bugs wore clogs and the kids played tick with hatchets. creating small missiles of blotting paper, dipped in the inkwell into which they had earlier peed, before balancing it at the end of a wooden, twelve inch, rule and adeptly flicking it vertically upwards at speed so that it would hit the white ceiling with a splat and remain there forever, so joining several other, earlier dispatched, blue, smelly, ‘blobs’. On occasions, when ‘Miss’ would wander through the class, one of them would creep to the blackboard and write naughty remarks whilst her back was turned. She had already learned to ignore such transgressions as to investigate would prove a futile, time wasting exercise. She never knew of the occasions when one of this despicable gang would, when walking past her, deliberately drop his pen and peer up her skirt as he picked it up, later to rudely announce the color of her bloomers that day. Ernie, what a good laugh I have had reading your post, it is so true! I too went to Bedford Road School and can picture myself playing in the playground. I remember the ink and milk monitors, however I never reached such ranks! I can see the girls, dresses tucked inside knickers while they performed cart wheels and handstands! I remember my mother picked up some bright tangerine wool really cheap. She knitted me what she thought was a lovely cardigan which finished below my knees. This I had to wear everyday to school in the winter to keep me warm. My friends would stand outside Bedford Road School waiting for me and would say they could see me coming from Stanley Road!!! Mum even managed to knit me a matching hat with the leftover wool, however once I left the house the hat was tucked in my knickers until I was out of sight!! I can remember assembly prayers and "Morning has broken like the first morning" hymn. I cannot remember many teachers, except a Ms. Swain? The picture Bob has shown looks like Balliol Road School. Such happy days! Ernie, what a good laugh reading your post, I can relate to it very well, I actually reached the rank of "ink monitor" and thought I was very important filling the ink wells the problem was that I was not very good at it having most of the ink all over the desk instead of in the hole of the ink well,eventually the job was given to some one else but I was still a very important person having been given the job off "blackboard cleaner", that suited me better, the downside of it was I couldn't reach the top of the board being only tiny,lol. I remember tucking my skirt in my knickers and practicing doing handstands and cartwheels neither of which I was very good at. Thank you for a good laugh. Elaine, I couldn't remember the name of our sewing teacher, thank's for reminding me, I was that bad at sewing that she would sit me in the corner of the classroom and make me read a book, I still can't sew to this day,lol. Mrs McBride didn't frighten me at all the one who scared me most was Miss Copeland, the maths teacher, I was that scared of her I couldn't concentrate so am no good at maths either,lol, don't know why I went to school really. Right I think I have located Bedford Rd School, but which is Baliol??? Memory must be going. The nearest to Bedford Road School, located just lower down than the A5058 island. I believe the school higher up was the Girls Grammar. We thought the girls there were so posh. Right. What I thought was Bedford school was Balliol. So I've now lost Bedford Rd School. Sorry Your Majesty...You were way out of my league. But nice to know we have plenty of upper class girls here. (Please read this as complimentary). Its surprising how text can be sometimes misunderstood). I fell for a girl from that school about 1950. (Mavis Baker who lived near Johnsons Dye Works. ) I had no chance. We would have been about 15 at the time. 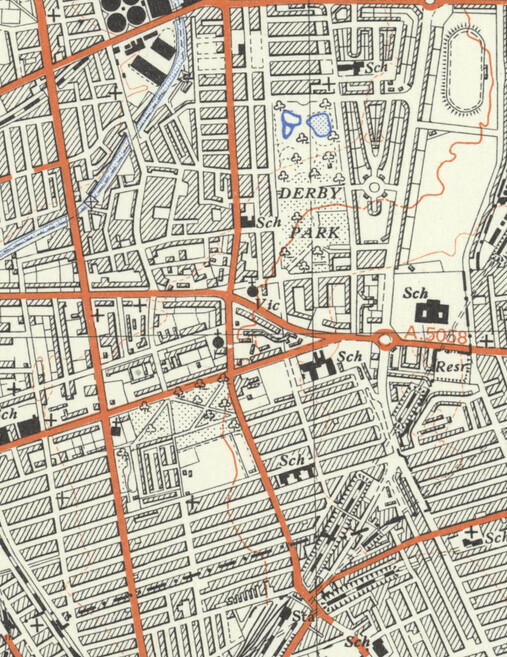 Bedford Rd School is the one shown on the second map on Bedford Road. 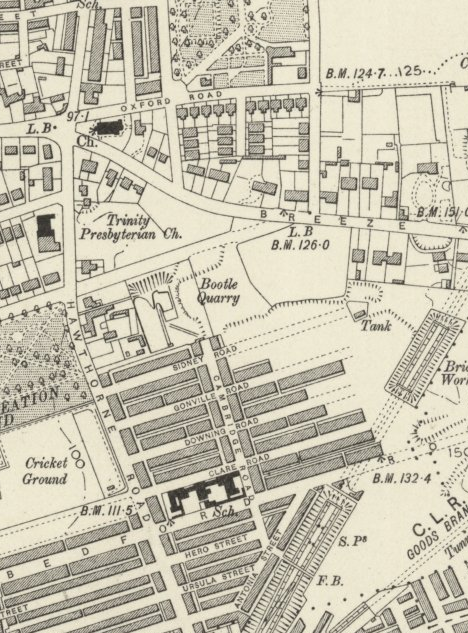 Looks like Balliol Rd School wasn't there then so it must be a very old map. I hope that is how you read my post as well. I must have gone to Guides at Balliol then . Oh I am well confused. Thank you Brian Grundy, enjoyed reading your post. I was born in 1945 and remember going to Quarry Bank School but could not remember where it was. PS just returned to USA after staying with lifelong friend in Maghull. Hi Brian, I had a friend in my class at school ( Balliol Road ) who had a crush on your Alan, all she did was talk about him, she got on every ones nerves, lol. My family lived in 140 Wadham Road for donkeys years! I lived at 55 Wadham Road from 1973 -1982.